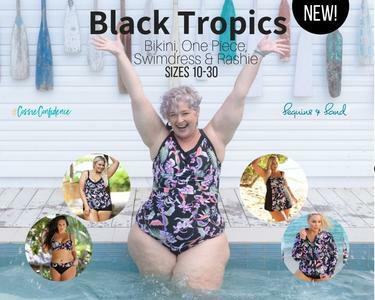 NEW Black Tropics Swimwear in Trusted Styles - D-G Cups Rejoice! . : Sequins and Sand Resort Wear :. NEW Black Tropics Swimwear in Trusted Styles - D-G Cups Rejoice! Black Tropics. The name says it all. A NEW black based swimwear print with swirls of tropical colours to add a fresh zest to your summer. It's gorgeous. I really love this NEW Black Tropics print. Super easy to mix and match with so many colours and back with black of course. It has a spirited vibe that I love without being too over the top. And then there's the Styles and Size that it comes in. D- G cups are well and truly covered (and supported) and we've got your number too: 10-30.
wide brim hat for a few clues. Let's go! Photos of all the Black Tropics styles are listed below with links to take you straight there! Here's a bit about each one so you can work out which is best for your shape. Underwire One Piece - best for a D-E, has been a favourite here at S&S for years. With ruching in all the right places it offers great tummy camouflage, not to mention extra length for those with a longer torso and bit of a tummy. The underwire, together with higher back and wider fully adjustable straps this cossie offers great support. The extra black trim along the neckline gives the cup extra depth too for great coverage. In sizes 10-22. As you can see our Cossie Confidence Crew girl from Qld, Tracey Dawes is over the moon with hers! Hands up if you love your Black Tropics One Piece! Underwire Tankini Top - like its sister style, the One Piece, it has the same bust construction for support and coverage. With an A Line shape, it offers more room to move about the belly and hips. In Sizes 12-22. Underwire Bikini Top - we've been selling this Capriosca basic style for years. A structured style with solid support through its moulded cups, underwire, a 3 hook fit at the back and fully adjustable straps. Go up a size if you are in between. They can fit a bit on the smaller side because of the structured nature of the cut. D-G Cup! Sizes 10-20. Rollover Bikini Pant - a great style for those who are after good bottom coverage but not the lower leg of a high waisted pant. Pears, I'm looking at you! The print is in the 'rollover band' so team it with any colour in the print, black or the matching Black Tropics print. Options a plenty girls! Sizes 10-22 too. Swimdress - in the fuller skirted style and deepest cup in the swimdress range. Maximum coverage and support is assured. The burst of colour in the centre panel jazzes it up nicely. D-G cups are easily accommodated in this style which is very popular with our Mums and Grandmas. Nice for a Christmas present girls. Sizes 14-30. Rashie - top off your beach and pool looks with the fabulous Rashie. Add colour to basic black or coral swimwear in the Capriosca range. Black and white will look fab with it too. Sun safe and stunning. Sizes 10-22. If you need a hand to select the style for you, then please Contact Us and we'll hop to it for you. And remember we offer FREE Returns where we pay the postage back if you make the wrong choice. We understand it can be tricky to buy swimwear online which is why we've always offered Free Returns to help take that concern away.